While the memory market is highly saturated, there's always a demand for RAM in the computer industry. Whether you are a computer enthusiast or a casual user, everyone knows what RAM is; and everyone has a rough idea of its importance inside personal computers. In this sense, what separates ideals of the casual user from the enthusiast is that, while the former will typically look at nothing much beyond capacity and price, the latter will demand properties such as overclocking and performance in addition to its price tag. With the A-DATA Extreme Edition DDR2 800+ dual channel kit, A-DATA promises enthusiast performance and features at a somewhat casual user's price. Will it live up to its name, and compete against more prominent brands in this segment such as OCZ and Corsair? We've put this very set to the tests to see if it's a pair of DDR2 that you want to dump some cash on your next upgrade. I've also had a little fun in Photoshop to improve the lighting effects in the photo above ;) Anyways, our review unit of A-DATA's Extreme Edition DDR2 800+ 2x1GB RAM came in a large cardboard box from A-DATA's offices in California, using FedEx International Economy. A-DATA carefully packed and shipped it with the box filled with packing peanuts to ensure that our RAM arrives in perfect working condition. Our review unit of A-DATA's Extreme Edition DDR2 800+ 2x1GB RAM came in retail packaging. A full blister seal was used to close off the clear plastic packaging; so we just used a boxcutter to unload its contents. The retail packaging features the pair of RAM in horizontal parallel alignment with each other across the front to reveal the memory module's sharp red heatspreaders. The black background blends in with racing pattern scheme in certain areas to create a sense of speed and performance associated with the memory. Basic information such as capacity and stock speeds are also highlighted in front. CPU-Z screenshots of both memory tabs. I've set the RAM latency settings to 4-4-4-12 in the BIOS, corresponding to the manufacturer's defined specifications. Using our Asus P5K-Deluxe, I used the higher limit of the voltage range at 2.1V and utilized 1T command rate -- which works perfectly, but for some reason it still says 2T in CPU-Z. 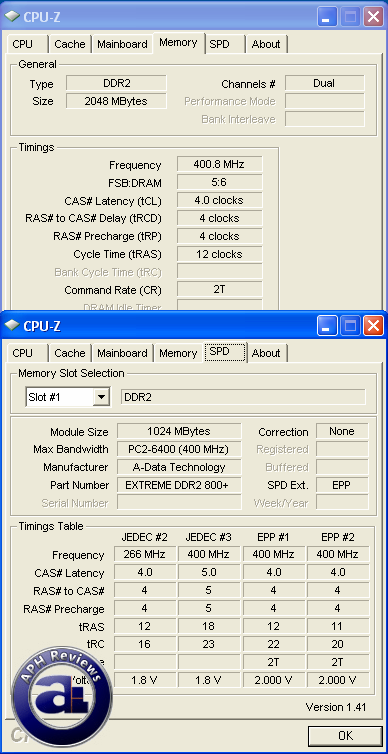 CPU-Z correctly detected the A-DATA Extreme Edition DDR2 800+ to support EPP profiles as well, and correctly displayed the latencies in the timings table.